England have been brought crashing back down to earth following their Rugby World Cup quarter-final-clinching victory over Scotland by fresh reports of embarrassing off-field antics. 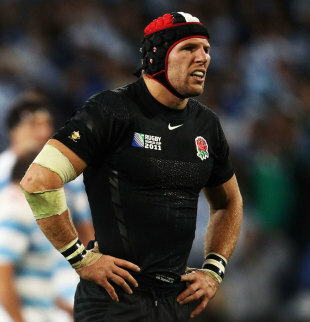 James Haskell, Dylan Hartley and Chris Ashton are at the centre of the latest allegations of misconduct that stem from their recent stay in Dunedin. Hotel worker Annabelle Newton, 23, has alleged that the players called her to their room, filmed her and shouted lewd comments although the trio emphatically deny any wrong-doing. "I was a joke to them. Afterwards they couldn't understand what they did wrong. Those players treated me with no respect," Newton told the Sunday Mirror. Newton's duties revolved around the England team and said the players regularly joked with her but feels they over-stepped the mark. "These guys towered over me. They were the tallest guys I have ever seen. I just remember James' stupid grin. He thought it was hilarious. Dylan was on the bed. Then they got out a video camera and started to film me. I tried to hide my face, saying I'm working." She told the newspaper that she was in tears afterwards and that their apology, which came eight days later, felt half-hearted. "I just got a sense they didn't care. I told him, I hear you guys got into a bit of trouble. Then one said, The heat's off us because of the Mike Tindall thing." England manager Martin Johnson has since reprimanded three players for their conduct and left them in "no doubt" about his anger. Addressing the latest allegations over player conduct to have blighted his side's World Cup campaign, he said: "I was angry with them. It is just the sort of thing we have talked about. "What they thought was humour and a light-hearted exchange has clearly not been taken that way by Annabel, the girl involved. At the time they apologised when they realised they had stepped over the mark. They had no idea how upset she subsequently became. "We were in Queenstown for a few days. When we returned I spoke to the hotel manager, apologised to him for the disturbance we had caused to him and his staff. The guys formally apologised. They were shocked when they understood how upset she had become. "We investigated the facts fully. They have been disciplined. They have been reprimanded for their behaviour and left in no doubt. If you leave yourself open for these headlines to be written it drags us all into it and that is what makes me particularly angry." Mike Tindall has also returned to the spotlight as a result of his actions during the team's short stay in Queenstown where a number of players enjoyed a drunken night out. Tindall, who was recently married to the Queen's grand-daughter, Zara Phillips, found himself on the front page of a number of tabloid newspapers after he was captured on CCTV in conversation with a woman in the Altitude Bar two days after England's pool win over Argentina. Tindall originally denied that he visited a second bar with the woman in question and was given legal support but following reports by the Mail on Sunday newspaper, the 32-year-old has admitted he also visited the Cowboys bar in the resort. Tindall's public relations company Juniper Sport issued a statement blaming the confuson on its client. "Mike Tindall gave his PR consultants and the Rugby Football Union his assurance that he had not attended the Cowboys bar, having left the Altitude bar. In good faith, his PR consultants, the RFU and the RFU's solicitors relied upon that assurance when dealing with last week's story. However, Mike now accepts that his recollection was incorrect and he apologises unreservedly for this misjudgment." Johnson has accepted any misleading information Tindall gave as to his whereabouts that night was a simple mistake and "not a cover-up". "If he was inaccurate in his recollection of the events of the night and his specific whereabouts, he certainly didn't mean to mislead anyone. It was not an orchestrated cover-up," Johnson said. "It was simply an error on his behalf which he apologises for." Asked whether he would consider sending Tindall home, Johnson added: "His recollection is wrong of where he's been, and the order he's in there, and that is what it is. There's video footage that was available at the time so I don't think he'd be foolish enough to think he could get away with lying because of the situation he's in and the evidence that's available. So I think it's an innocent mistake and his recollection was incorrect." Before the squad left for New Zealand, Johnson said he would not ban alcohol or impose curfews but he warned his squad to be mindful of their conduct during the World Cup. "They are there to make sensible decisions. If I can't trust them, there is a simple choice for us to make," he said at the time. Johnson today insisted he still trusted his players. The manager, who has played in the same team as many of the squad, denied that his close relationship with them would lead to them "taking liberties". "I don't think they will take liberties," he said, before insisting he was confident there were no more stories of this nature to come out. Yeah, I am. I think it was a shock to those players that they'd left themselves open to appearing on the front page of a paper. That's upsetting for them, and it's obviously not great for the team. I don't want to sit here talking about these allegations when we've qualified for the quarter-finals of a World Cup."